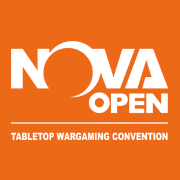 Where to Find: Search for #dreadtober on twitter, facebook, or dreadtober in blog posts! 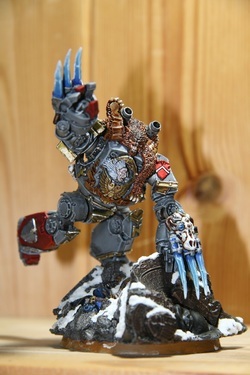 Dan from Forged has added bruising to his helbrute, which has created a really awesome effect I've never seen before! 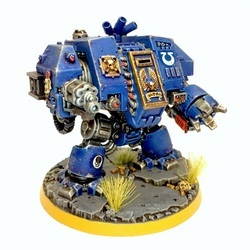 Blaz has finished his ultramarine dreadnought, and he looks great. Fantastic work! 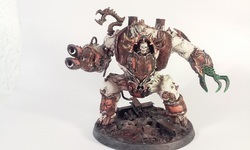 Adam is right at the cusp of finishing his awesome dread helbrute conversion. He pushed really hard, but didn't quite make it. Still, it's a fantastic piece and he should be very proud! Cascadian Grimdark has gotten some primer on his Dreads! Now comes the grand push to get things done! 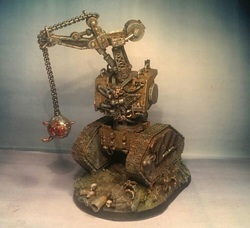 Da Big Boss has finished Wrecks, his awesome, super converted, death bringing, hug machine. I'm a big fan of his style, and this is just an amazing piece of work! 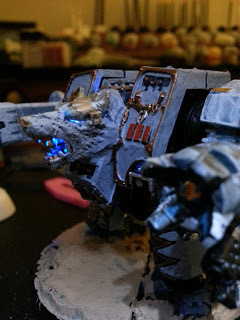 Chandler from FTGT has completed an LED Wolf Works SW Dreadnought! It looks awesome...and it's got LEDS! 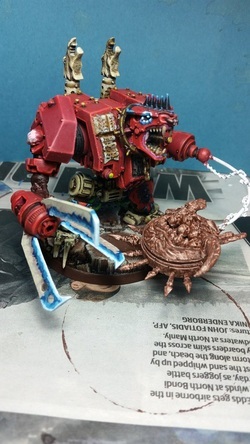 David, from OpwizardIRL has finished his blood angels dreadnought! Flipping awesome! CaptainHelvetos has finished his dread, but not the base. I consider that still a finish! Great job buddy! 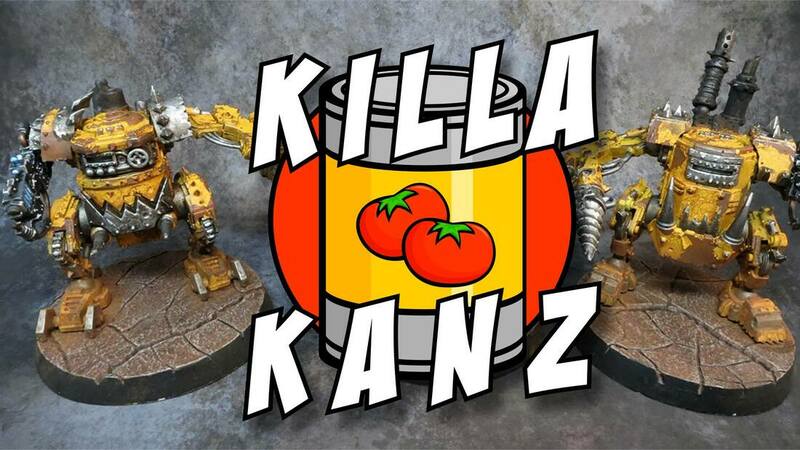 Mike has finished his awesome Killa kan! Mike from Mini Mayhem has gotten a ton more work done on his dreads and mega nobz. Though he didn't reach a state he would call complete, he is doing an insane amount of work here. Just those nobz have endless amounts of detail on them! 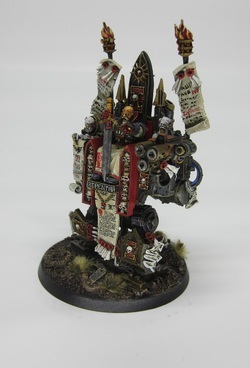 Jason has finished his incredible scratch build deff dread. It follows the original style, but is massively upgraded! I love it! 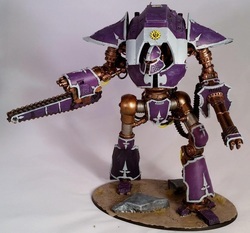 Grenn from Xeno4thewin has finished his imperial knight! 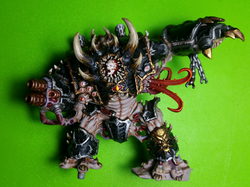 Rory finished his helbrute, and I was confused, as he had started a second model for dreadtober. He actually finished weeks ago. Sorry Rory and great job! 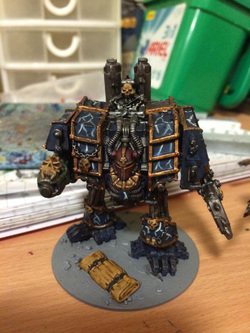 Paul finishes his dreadnought for #dreadtober! A gorgeous levithan dread...that you can't even buy yet. I want one! Crimson Oracle finishes his awesome Mhara Gal just in time! 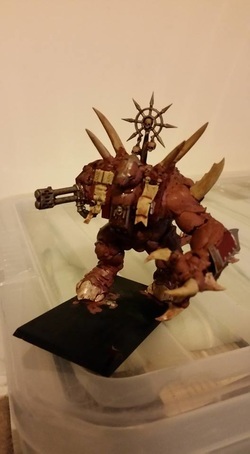 Wudugast from Convert or Die has finished his amazing helbrute! Bash Bates has now finished his second dread! 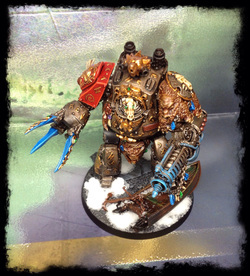 Thomas has finished his helbrute, completing his #dreadtober pledge! You guys gotta check this thing out. It is AMAZING. 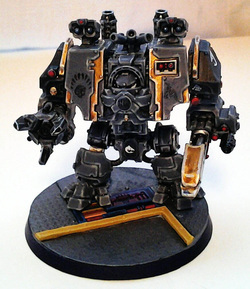 Then of course, thomas went and showed off, and painted a SECOND #dreadtober entry! Freaking great job buddy! 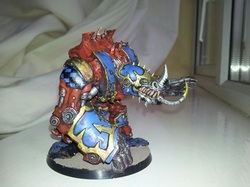 Turkadactyl has finished his space sharks FW ironclad. Awesome awesome work buddy! 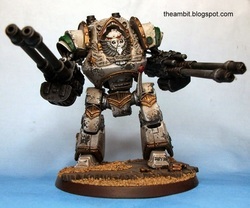 He then went and finished a SECOND dreadtober entry, an awesome siege dreadnought! Dr Gumby has finished his leaping murder face 3000 dread of +1 leaping. It came out AWESOME! 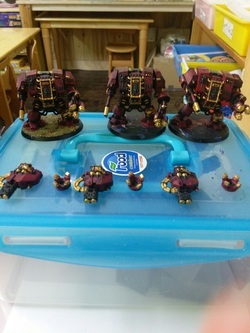 John @40k Hobby Blog pretended to save his deff dread for competition, and instead has painted four 6mm epic dreadnoughts. You wouldn't even think they were 6mm from the detail he got out of them! Awesome work John! 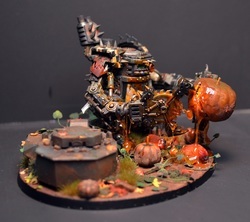 Todd has finished his amazing pumpkan eater for Dreadtober. It is amazing. Such funny and well executed work Todd! 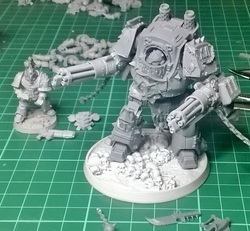 Witchhunter pops up on the feed with an ironwarriors contemptor! Farbror finished an ironclad when I wasn't looking. 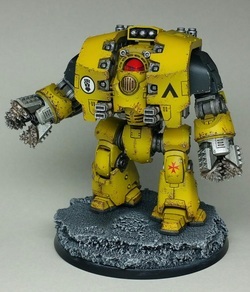 I totally missed his #dreadtober tags on twitter! Apologizes buddy! NafNaf 's Bjorn has been completed. Absolutely stunning and gorgeous conversion. Nafnaf seems to get better everytime I hit refresh on his page! 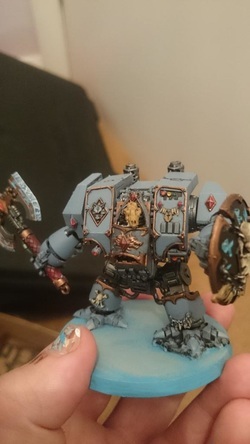 Mordain7th has finished his beautiful Contemptor dreadnought. Stellar job! 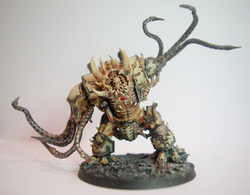 Steven from victorygamers, has finished his amazing nurgle themed daemon killa kan! 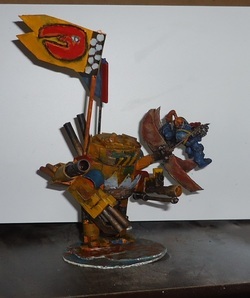 Jeff has finished his amazingly dynamic ironclad. I never thought this was possible in the original model. So well done Jeff! 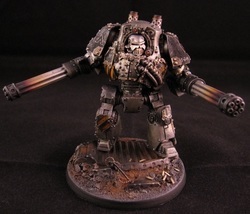 Jay finished his awesome DA Dreadnought! Even his first freehand! Theambit has finished his amazing dread. Those shoulders just look so flipping awesome on him. 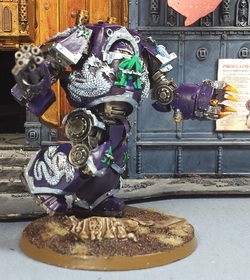 Nick has almost completed his dreadtober entry...which is amazing, because of all the other work (and fathering) he's doing! 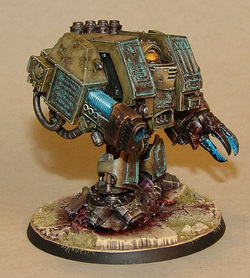 Feldwick joins in with the other stepping between game #dreadtober guys, with his own aweesome convertered death machine! tOther gets some paint and wash on his abomination! Arto swaps from the stompa to a much more manageable Sons of Horus Contemptor! BeeCee from FTGT had started working on his death company Dread, just in time! 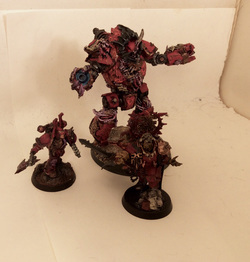 Rednekkboss has completed his awesome Ven dread, covered in the gore and blood from his tyranid conquests! 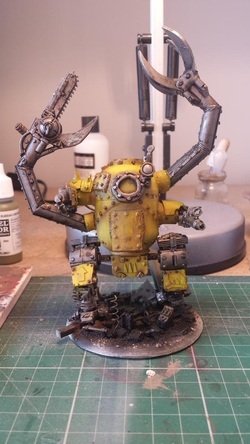 Aruki from Gruntlove has finished all THREE of his #dreadtober entry! Awesome job! 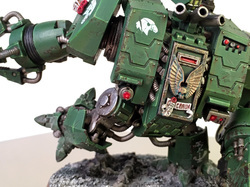 Jason from Headwound mini's has completed an absolutely gorgeous contemptor dreadnought. Really love the work on this guy! 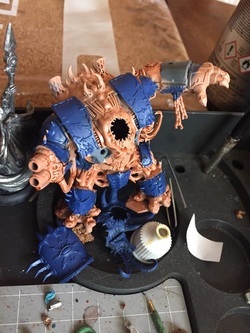 Chris has started on his Helbrute, and is making excellent progress already! 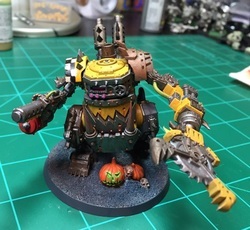 Xeno Inferno has FINISHED his scratch built deff dread for dreadtober. Great job!!!! 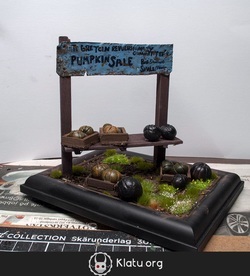 Nils has started working on his base. It's so fun and filled with character! I'm working on a necron stalker for Macathu, and a killa kan for the event! 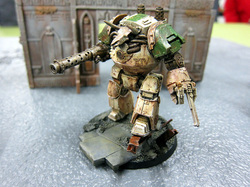 Dave has started his contemptor by sanding off all the sissy pants imperial iconography. He's got a great pose already, and it's looking ace! FTGT have jumped in with some new weathering and chipping effects on their dreads!